Montreal is an amazi ng, diverse city, rich in heritage and culture. It is also a city of contradictions – a paradox. It is city built on a river and one of the most important ports in Canada and yet it’s almost 1,000 miles from the sea! On first viewing Montreal is also clearly a North American city with tall skyscrapers, wide boulevards and a grid road system. It also has extremely cold winters which has led to the development of the ‘underground city’ to protect the citizens in difficult conditions. This is what makes Montreal so fascinating – the rich mix of French, European, First Nation and contemporary Canadian cultures. It also feels very much like home to me – that European feel, with more than half of the population French speaking and evidence of Scottish heritage and many familiar names from our islands including McGill University! In the same way that palliative care embraces a wide diversity of interdependent disciplines and areas of expertise so does this event. It brings together academics, practitioners, researchers, leaders from across the world – this year 1800 delegates from over 60 countries. Add to that art, music, literature and creative reflections at the beginning of each session to lead us from the distractions that crowd our minds, into a focused awareness of shared experience – and this Congress is thought-provoking and restorative in equal measure. What struck me about this Congress during my first visit, and on each attendance since, is that over its 40 year history this event remains consistently aligned with the very precious work with which we are all engaged. The Congress, organised by the faculty of palliative care at McGill University ensures that the plenaries are informative, challenging and often at the edge of our sphere of thinking. This year Congress opened with Professor David Clark followed by Okello Sam a former child soldier from Uganda who has established a foundation to support former child soldiers in their road to something near recovery. He described the recruitment process for child soldiers and also the means by which these children were forced to stay in the ‘army’. His foundation is demonstrating that recovery is possible by creating a safe community of peers, using creative arts to build confidence and self-esteem, practical support e.g.providing hearing tests and appropriate hearing aids. This Ugandan foundation of Hope provides love, care and support – it looks, feels and is palliative care, just not quite as we know it. This was the fourth Congress for members of the CHAS team. In previous years we have delivered a range of projects: we have taken an art installation involving over 20 pieces of the children’s art with the ‘explanation’ boards in both English and French (thanks to a volunteer for helping us with that bit! ); delivered creative arts workshops; and talked about the complexity around transitions from children’s to adult services. This year we had similar diversity from our team: our work with Napier University in scoping the future education needs for children’s palliative care; memory making in neonatal palliative care; the development of a national community pharmacy network for children; and transforming volunteer engagement through the power of the volunteer voice and digital technology. The closing plenary this year was a privilege to witness: Dr Balfour Mount, who established this Congress 44 years ago, in close conversation with Thupten Jinpa, the Dalai Lama’s Principal Translator and Fr Laurence Freeman, Director of The Centre for Christian Meditation. These three men clearly know each other incredibly well and through the in-depth dialogue they helped delegates to understand that connecting with one’s own inner compassion is key to resilience and personal spiritual renewal. Two crucial factors for those on the front lines of acute care-giving. This is my take away this year. 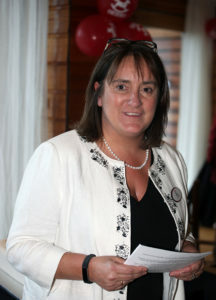 Maria McGill is a Trustee for Together for Short Lives. Maria has 22 years’ experience in specialist palliative care and has been the Chief Executive of Children’s Hospices Across Scotland (CHAS) since October 2010.